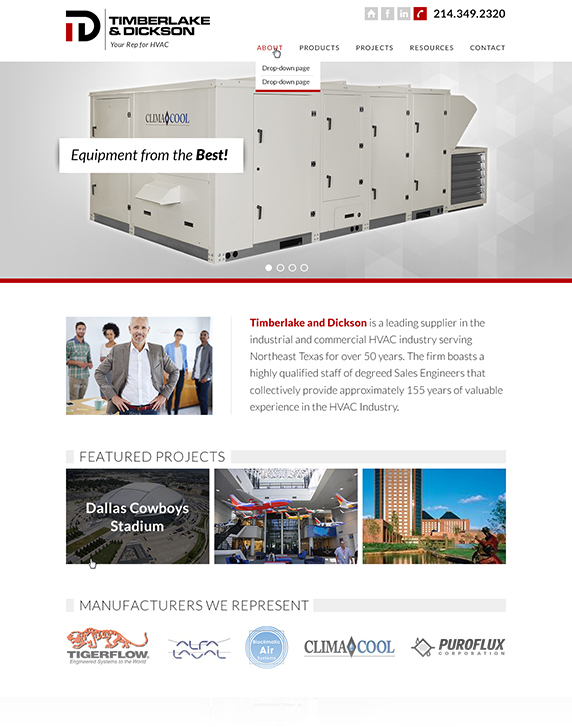 Timberlake & Dickson, Inc. has been a leader in the industrial and commercial HVAC industry serving North and East Texas for over 50 years. The website for Timberlake & Dickson focused on the needs of reaching their clients - engineers, architects, and mechanical contractors. Providing attractive graphics highlighting the manufacturers Timberlake & Dickson represent while profiling projects that have been completed recently. In 2014, Century Sales & Service a division of Timberlake & Dickson, wanted to rebrand and develop a new website. In the the 3rd quarter of 2015, Timberlake & Dickson continued the rebranding for itself. The HVAC Girl was commissioned to develop a new logo and a new website. You can see the transformation between the previous logo and the new logo. Color schemes were changed to be cohesive with Century Sales & Service and the logo was designed with all levels of media in mind – drawings, business cards, polo shirts, and everything in between.